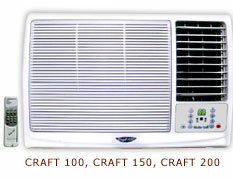 Airconditioners specially designed to suit the harsh Indian climate. Manufactured with the latest technology, fitted with electro-dynamically balanced fan blade and blower systems, thus eliminating any vibration to make you enjoy the melody of just a whispering presence. The Condensor evaporator systems are manufactured out of Super slit and ripple fins with inner grooves and perfect bonding in a state of the Art Plant to give you the highest cooling power with the lowest consumption. Super Saving Weather Craft saves substantially on your electricity bills, due to its perfectly balanced system and energy-efficiency, which in turn depends on its critical capillary design and optimum airconditioning cycle. The Weather Craft grill comes to you in a choice of finish and polish, blending subtly with your decor. Available in both side throw and top throw models. Plain, Sisam Finished or Fibre Grill.
. With Cordless Remote Control.
. Freight, Insurance and Port Charges Included. .
. *Power 220V / 50Hz / 1 Phase.